In the past, PVOD has been described by various terms, such as pulmonary venous sclerosis, obstructive disease of the pulmonary veins, or the venous form of primary pulmonary hypertension. As the name suggests, PVOD is a clinicopathologic entity characterized by occlusion or narrowing of the pulmonary veins and venules by sometimes loose, sometimes more dense and collagen-rich, fibrous tissue,  leading to clinical manifestations that are, in many ways, similar to PAH. (See Pathophysiology, Etiology, Presentation, and Workup.) However, owing to the differences in pathology and response to PAH-specific therapy, it was classified in a unique group 1 in the pulmonary hypertension classification in 2009. Although the term pulmonary veno-occlusive disease was first used in the 1960s, the first case was described by Dr J. Hora in 1934 in a 48-year-old patient who died within one year of diagnosis with symptoms of right-sided heart failure. Historically, the disease has been underdiagnosed, possibly because of lack of awareness by clinicians. Regardless of the mechanism of injury, the end result in pulmonary veno-occlusive disease (PVOD) is constriction and/or occlusion of the pulmonary veins and venules. In the early stage, the occlusion may be from loose, edematous tissue, which later transforms into dense and sclerotic fibrous tissue. Eccentric intimal thickening is seen in the lobular septal veins and venules and, rarely, in the larger veins. In addition, dilatation of lymphatics occurs. Medium-power photomicrograph (original magnification, X10; hematoxylin and eosin stain) demonstrates a fibrotic interlobular septum containing a vein with an occluded lumen (arrowhead). The occlusion is composed of dense, collagen-rich, fibrous tissue. Image courtesy of Thoracic Imaging Section, Department of Radiologic Pathology, Armed Forces Institute of Pathology. Radiation exposure is a well-recognized cause of vascular injury. A case of PVOD that may be associated with previous mantle irradiation for Hodgkin lymphoma has been reported. However, the presence of a prothrombotic state in malignancies, especially in adenocarcinomas, simultaneously with exposure to chemotherapeutic agents and radiotherapy precludes the establishment of a firm cause-and-effect relationship between malignancy and PVOD. The association of some cases of PVOD with oral contraceptive use or pregnancy has lent some support to the theory that PVOD is related to coagulation disorders, but an absence of thrombosis in other organs may refute this notion. An annual incidence of PVOD of 0.1-0.2 case per million persons in the general population has been suggested based on the incidence of primary pulmonary hypertension in the general population. [27, 28] Note, however, that such indirect estimates of a rare disease’s incidence may be imprecise. The age at diagnosis ranges from eight weeks  to the seventh decade of life with most reported cases occurring in young adults. PVOD in siblings tends to have an early onset usually within the first three decades of life. Rounds S, Cutaia MV. Pulmonary hypertension: Pathophysiology and clinical disorders. Baum GL, Crapo JD, Celli BR, Karlinsky JB, eds. Textbook of Pulmonary Diseases. Philadelphia, Pa: Lippincott-Raven; 1998. 1273-95. Wagenvoort CA. 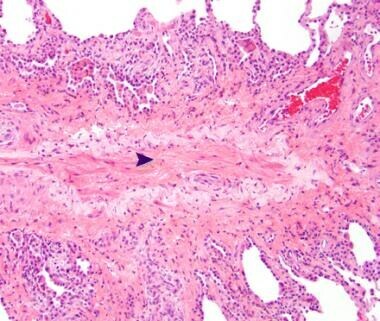 Lung biopsy specimens in the evaluation of pulmonary vascular disease. Chest. 1980 May. 77(5):614-25. [Medline]. Thadani U, Burrow C, Whitaker W, et al. Pulmonary veno-occlusive disease. Q J Med. 1975 Jan. 44(173):133-59. [Medline]. Wagenvoort CA. Pulmonary veno-occlusive disease. Entity or syndrome?. Chest. 1976 Jan. 69(1):82-6. [Medline]. Hora J. Zur Histologie der klinischen "primaren Pulmonalsklerose". Frankfurt Z Pathol. 1934. 47:100-08. Chazova I, Robbins I, Loyd J, et al. Venous and arterial changes in pulmonary veno-occlusive disease, mitral stenosis and fibrosing mediastinitis. Eur Respir J. 2000 Jan. 15(1):116-22. [Medline]. Wagenvoort CA, Wagenvoort N, Takahashi T. Pulmonary veno-occlusive disease: involvement of pulmonary arteries and review of the literature. Hum Pathol. 1985 Oct. 16(10):1033-41. [Medline]. Lathen C, Zhang Y, Chow J, Singh M, Lin G, Nigam V, et al. ERG-APLNR axis controls pulmonary venule endothelial proliferation in pulmonary veno-occlusive disease. Circulation. 2014 Sep 30. 130(14):1179-91. [Medline]. [Full Text]. Dai Z, Matsui Y. Pulmonary veno-occlusive disease: an 80-year-old mystery. Respiration. 2014. 88(2):148-57. [Medline]. Sanderson JE, Spiro SG, Hendry AT, et al. A case of pulmonary veno-occlusive disease respondong to treatment with azathioprine. Thorax. 1977 Apr. 32(2):140-8. [Medline]. Kishida Y, Kanai Y, Kuramochi S, et al. Pulmonary venoocclusive disease in a patient with systemic lupus erythematosus. J Rheumatol. 1993 Dec. 20(12):2161-2. [Medline]. Zhang L, Visscher D, Rihal C, et al. Pulmonary veno-occlusive disease as a primary cause of pulmonary hypertension in a patient with mixed connective tissue disease. Rheumatol Int. 2007 Oct. 27(12):1163-5. [Medline]. Morassut PA, Walley VM, Smith CD. Pulmonary veno-occlusive disease and the CREST variant of scleroderma. Can J Cardiol. 1992 Dec. 8(10):1055-8. [Medline]. Johnson SR, Patsios D, Hwang DM, et al. Pulmonary veno-occlusive disease and scleroderma associated pulmonary hypertension. J Rheumatol. 2006 Nov. 33(11):2347-50. [Medline]. McDonnell PJ, Summer WR, Hutchins GM. Pulmonary veno-occlusive disease. Morphological changes suggesting a viral cause. JAMA. 1981 Aug 7. 246(6):667-71. [Medline]. Escamilla R, Hermant C, Berjaud J, et al. Pulmonary veno-occlusive disease in a HIV-infected intravenous drug abuser. Eur Respir J. 1995 Nov. 8(11):1982-4. [Medline]. Davies P, Reid L. Pulmonary veno-occlusive disease in siblings: case reports and morphometric study. Hum Pathol. 1982 Oct. 13(10):911-5. [Medline]. Voordes CG, Kuipers JR, Elema JD. Familial pulmonary veno-occlusive disease: a case report. Thorax. 1977 Dec. 32(6):763-6. [Medline]. Runo JR, Vnencak-Jones CL, Prince M, et al. Pulmonary veno-occlusive disease caused by an inherited mutation in bone morphogenetic protein receptor II. Am J Respir Crit Care Med. 2003 Mar 15. 167(6):889-94. [Medline]. Joselson R, Warnock M. Pulmonary veno-occlusive disease after chemotherapy. Hum Pathol. 1983 Jan. 14(1):88-91. [Medline]. Knight BK, Rose AG. Pulmonary veno-occlusive disease after chemotherapy. Thorax. 1985 Nov. 40(11):874-5. [Medline]. Liu L, Sackler JP. A case of pulmonary veno-occlusive disease: Etiological and therapeutic appraisal. Angiology. 1973. 23:299-304. Williams LM, Fussell S, Veith RW, et al. Pulmonary veno-occlusive disease in an adult following bone marrow transplantation. Case report and review of the literature. Chest. 1996 May. 109(5):1388-91. [Medline]. Hosokawa K, Yamazaki H, Nishitsuji M, Kobayashi S, Takami A, Fujimura M, et al. Pulmonary Veno-occlusive Disease Following Reduced-intensity Allogeneic Bone Marrow Transplantation for Acute Myeloid Leukemia. Intern Med. 2012. 51(2):195-8. [Medline]. Kramer MR, Estenne M, Berkman N, et al. Radiation-induced pulmonary veno-occlusive disease. Chest. 1993 Oct. 104(4):1282-4. [Medline]. Cassart M, Gevenois PA, Kramer M, et al. Pulmonary venoocclusive disease: CT findings before and after single-lung transplantation. AJR Am J Roentgenol. 1993 Apr. 160(4):759-60. [Medline]. Mandel J, Mark EJ, Hales CA. Pulmonary veno-occlusive disease. Am J Respir Crit Care Med. 2000 Nov. 162(5):1964-73. [Medline]. Szturmowicz M, Kacprzak A, Szołkowska M, Burakowska B, Szczepulska E, Kuś J. Pulmonary veno-occlusive disease: pathogenesis, risk factors, clinical features and diagnostic algorithm - state of the art. Adv Respir Med. 2018. 86 (3):[Medline]. Wagenvoort CA, Losekoot G, Mulder E. Pulmonary veno-occlusive disease of presumably intrauterine origin. Thorax. 1971 Jul. 26(4):429-34. [Medline]. Shackelford GD, Sacks EJ, Mullins JD, et al. Pulmonary venoocclusive disease: case report and review of the literature. AJR Am J Roentgenol. 1977 Apr. 128(4):643-8. [Medline]. De Vries TW, Weening JJ, Roorda RJ. Pulmonary veno-occlusive disease: a case report and a review of therapeutic possibilities. Eur Respir J. 1991 Sep. 4(8):1029-32. [Medline]. Cohn RC, Wong R, Spohn WA, et al. Death due to diffuse alveolar hemorrhage in a child with pulmonary veno-occlusive disease. Chest. 1991 Nov. 100(5):1456-8. [Medline]. Rabiller A, Jais X, Hamid A, et al. Occult alveolar haemorrhage in pulmonary veno-occlusive disease. Eur Respir J. 2006 Jan. 27(1):108-13. [Medline]. Rosenthal A, Vawter G, Wagenvoort CA. Intrapulmonary veno-occlusive disease. Am J Cardiol. 1973 Jan. 31(1):78-83. [Medline]. Glassroth J, Woodford DW, Carrington CB, et al. Pulmonary veno-occlusive disease in the middle-aged. Respiration. 1985. 47(4):309-21. [Medline]. Bolster MA, Hogan J, Bredin CP. Pulmonary vascular occlusive disease presenting as sudden death. Med Sci Law. 1990 Jan. 30(1):26-8. [Medline]. Swensen SJ, Tashjian JH, Myers JL, et al. Pulmonary venoocclusive disease: CT findings in eight patients. AJR Am J Roentgenol. 1996 Oct. 167(4):937-40. [Medline]. Laveneziana P, Montani D, Dorfmuller P, Girerd B, Sitbon O, Jais X, et al. Mechanisms of exertional dyspnoea in pulmonary veno-occlusive disease with EIF2AK4 mutations. Eur Respir J. 2014 Oct. 44(4):1069-72. [Medline]. Holcomb BW Jr, Loyd JE, Ely EW, et al. Pulmonary veno-occlusive disease: a case series and new observations. Chest. 2000 Dec. 118(6):1671-9. [Medline]. Maltby JD, Gouverne ML. CT findings in pulmonary venoocclusive disease. J Comput Assist Tomogr. 1984 Aug. 8(4):758-61. [Medline]. Resten A, Maitre S, Capron F, et al. [Pulmonary hypertension: CT findings in pulmonary veno-occlusive disease]. J Radiol. 2003 Nov. 84(11 Pt 1):1739-45. [Medline]. Gunther S, Jais X, Maitre S, Berezne A, Dorfmuller P, Seferian A, et al. Computed tomography findings of pulmonary veno-occlusive disease in scleroderma patients presenting with precapillary pulmonary hypertension. Arthritis Rheum. 2012 May 1. [Medline]. Dufour B, Maitre S, Humbert M, et al. High-resolution CT of the chest in four patients with pulmonary capillary hemangiomatosis or pulmonary venoocclusive disease. AJR Am J Roentgenol. 1998 Nov. 171(5):1321-4. [Medline]. Seferian A, Helal B, Jais X, Girerd B, Price LC, Gunther S, et al. Ventilation perfusion lung scan in pulmonary veno-occlusive disease. Eur Respir J. 2011 Nov 16. [Medline]. Bailey CL, Channick RN, Auger WR, et al. "High probability" perfusion lung scans in pulmonary venoocclusive disease. Am J Respir Crit Care Med. 2000 Nov. 162(5):1974-8. [Medline]. Rubin LJ. Primary pulmonary hypertension. N Engl J Med. 1997 Jan 9. 336(2):111-7. [Medline]. Ogawa A, Miyaji K, Yamadori I, Shinno Y, Miura A, Kusano KF, et al. Safety and Efficacy of Epoprostenol Therapy in Pulmonary Veno-Occlusive Disease and Pulmonary Capillary Hemangiomatosis. Circ J. 2012 Apr 5. [Medline]. Nicod P, Moser KM. Primary pulmonary hypertension. The risk and benefit of lung biopsy. Circulation. 1989 Nov. 80(5):1486-8. [Medline]. Boucly A, Girerd B, Bourlier D, Nemlaghi S, Caliez J, Savale L, et al. [Pulmonary veno-occlusive disease]. Rev Mal Respir. 2018 Feb. 35 (2):160-170. [Medline]. Izbicki G, Shitrit D, Schechtman I, et al. Recurrence of pulmonary veno-occlusive disease after heart-lung transplantation. J Heart Lung Transplant. 2005 May. 24(5):635-7. [Medline]. Palmer SM, Robinson LJ, Wang A, et al. Massive pulmonary edema and death after prostacyclin infusion in a patient with pulmonary veno-occlusive disease. Chest. 1998 Jan. 113(1):237-40. [Medline]. Montani D, Achouh L, Dorfmuller P, et al. Pulmonary veno-occlusive disease: clinical, functional, radiologic, and hemodynamic characteristics and outcome of 24 cases confirmed by histology. Medicine (Baltimore). 2008 Jul. 87(4):220-33. [Medline]. Davis LL, deBoisblanc BP, Glynn CE, et al. Effect of prostacyclin on microvascular pressures in a patient with pulmonary veno-occlusive disease. Chest. 1995 Dec. 108(6):1754-6. [Medline]. Badesch DB, Abman SH, Ahearn GS, Barst RJ, McCrory DC, Simonneau G, et al. Medical therapy for pulmonary arterial hypertension: ACCP evidence-based clinical practice guidelines. Chest. 2004 Jul. 126(1 Suppl):35S-62S. [Medline]. Gilroy RJ Jr, Teague MW, Loyd JE. Pulmonary veno-occlusive disease. Fatal progression of pulmonary hypertension despite steroid-induced remission of interstitial pneumonitis. Am Rev Respir Dis. 1991 May. 143(5 Pt 1):1130-3. [Medline]. Pulmonary veno-occlusive disease in a 43-year-old man. An axial computed tomography (CT) scan (lung window level) shows multiple septal lines (arrowhead) and a dilated central pulmonary artery (arrow). Image courtesy of Thoracic Imaging Section, Department of Radiologic Pathology, Armed Forces Institute of Pathology.